The United Farm Workers of America (UFW) is a union for those who work on or with farms. 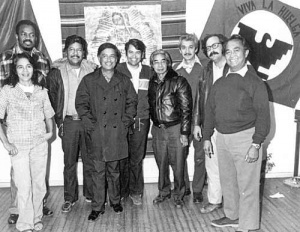 The United Farm Workers Executive Board in 1973 included veteran farmworker organizers and activists:(l-r) Dolores Huerta, Mack Lyons, Richard Chavez, Cesar Chavez, Eliseo Medina, Philip Veracruz, Gilbert Padilla, Marshall Ganz and Pete Velasco. The UFW's 50th Anniversary convention was held Saturday, May 19,2012. Rabobank Convention Center. Keene, California. • A three-hour program (1-4 p.m.) honoring the UFW pioneers, with special segments on the 1962 founding convention, 1965-1970 grape strikers and boycotters, 1966 peregrinos who marched from Delano to Sacramento, the Filipino American grape strikers and the farm worker ministry. Among the speakers were Dolores Huerta, Chris Hartmire and Luis Valdez, whose Teatro Campesino performed old union songs and actos throughout the program. • Other speakers included California Democratic Party Chairman John Burton and Maria Elena Durazo, former farm worker and head of the Los Angeles County Federation of Labor. • Mass at 7:45 a.m. with Bishop Richard Garcia from the Monterey Diocese presiding, honoring the rive UFW martyrs. • A program highlighting multiple new UFW organizing campaigns among strawberry, vegetable, tomato and melon workers in the Central Coast and Central Valley in the wake of Governor Jerry Brown signing a UFW-sponsored law in 2011. SB 126 says if growers cheat by breaking the law and denying farm workers their union, then the state can immediately certify the union and get the workers a contract. It also speeds up the process so farm workers don’t have to wait two years before starting negotiations and it lets the ALRB general counsel go to court to reinstate farm workers illegally fired during union election drives. • Among the speakers were U.S. Secretary of Labor Hilda Solis, United Auto Workers President Bob King, Univision anchor Maria Elena Salinas and Los Angeles Mayor Antonio Villaraigosa. This page was last modified on 22 August 2015, at 15:39.